You’ve probably heard that a lot this summer as you hit the highways and back roads for new adventures, or just head out for a quick trip to the grocery store. Safety behind the wheel is your ‘job one’ no matter how long or short the drive. Always make sure to keep your eyes on the road, stay aware and awake, and exercise extra patience. 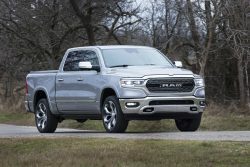 The 2019 Ram 1500 does its part by offering the very latest in advanced safety and security technology to help keep that road trip happy and stress-free. This #TruckThursday we launch a new month-long series focused on these advanced safety and security technologies with Heather Scott, FCA project chief for the department of Active Chassis, Driver Assistance and Passive Safety. She’ll help us get better acquainted with systems like 360 Surround View and adaptive cruise control, explaining what they are and how they work to keep your road trip humming along. Kicking off our series, Scott takes a deeper dive into the Blind-spot Monitoring and Rear Cross Path detection systems. Next week on #TruckThursday, Scott demonstrates how the 360 Surround View system offers much needed confidence behind the wheel with a bird’s-eye view of the immediate environment around your truck at all times.